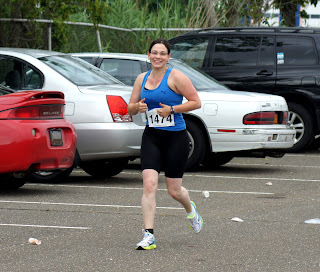 Today was opposite day: wife's day to race, my turn to cheer. 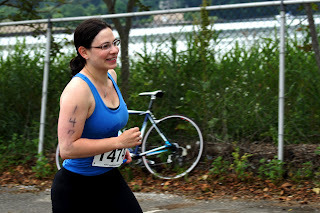 After all the support she's given me through my triathlon endeavors I was all too glad to be on the sidelines cheering on Mrs. Z in her very first race. 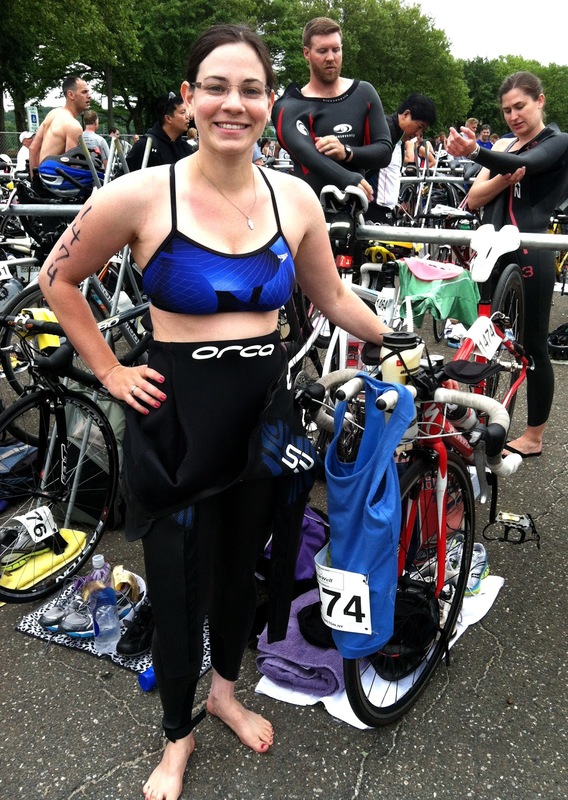 Every newbie triathlete has their own hurdles to conquer and I am so proud of the commitment and dedication Rachel had over the 6 weeks. 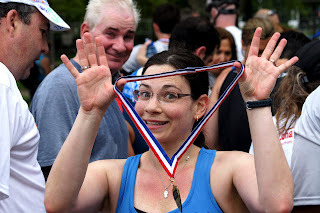 Once she made up her mind that she would Tri, there was no quit. Today her hard work paid off. 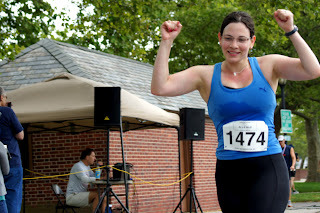 Our 4-person spectating crew covered a ton of ground as we cheered Rachel (and the other racers) on any chance we had. Through the whole race she looked strong and confident. I couldn't help but think back to my first race and I know I didn't look nearly as good as she did today. 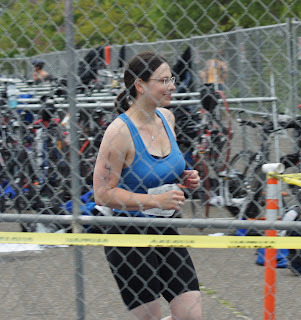 I knew her swim would go well, but I was still shocked when she emerged from the water so quickly. I jogged alongside as she headed for T1 (once again remembering her doing the same for me as I huffed and puffed about 4 months ago) and inch by inch worked her wetsuit off. Into transition she went where she learned just how hard it can be to get clothed while wet. All dressed and an uneventful mount and she was on her way on the bike. Right about when I expected she returned from the ride and had a smooth dismount (with enough time for a nice camera pose). The bike is certainly Rachel's biggest challenge; with the ride behind her all that separated her from the finish was the run. Again I paced alongside for a minute or two both showing my support and I suppose scratching my race itch. 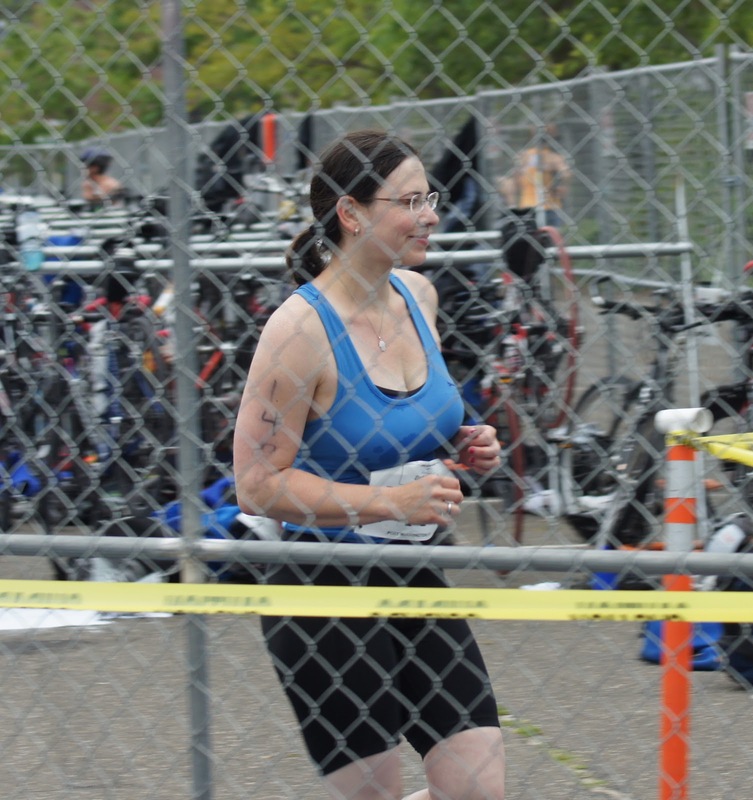 Eventually I said goodbye and headed to the finish line to watch her finish. Again, looking solid she made her way down the final shoot. After running for only a few months and swimming and biking for a month she'd conquered a challenge many people will never attempt. The best part of Rachel's triathlon had to be that every time I saw her she had a huge smile on her face. I'd like to think it was because she was seeing me but I know that's not it! Rachel brings a positive energy and infectious enthusiasm to everything she does. Today's race was no different. Through the course of an hour and a half triathlon everyone will feel some kind of discomfort, some give in, some struggle through, and some just smile. I love these pictures!! So proud of Rachel! Taco. Burrito. What's Coming Out of Your Speedo!